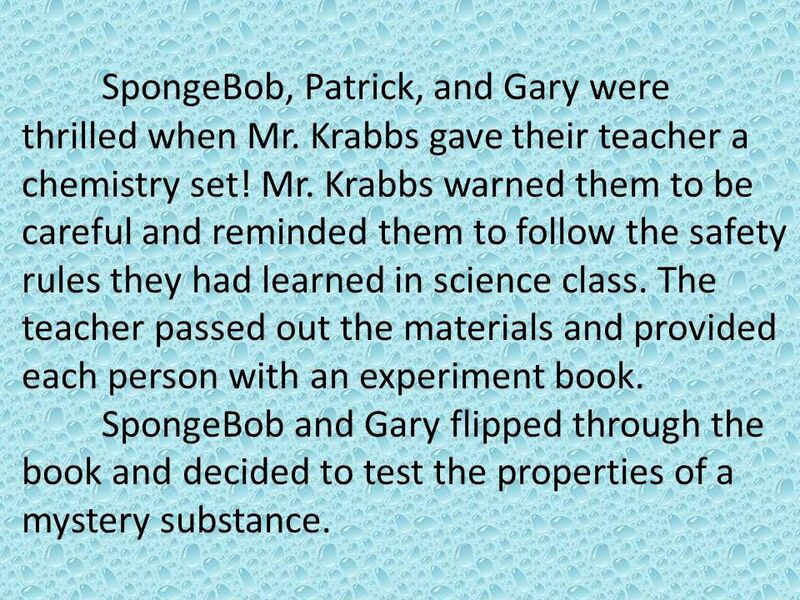 SpongeBob, Patrick, and Gary were thrilled when Mr. Krabbs gave their teacher a chemistry set! Mr. Krabbs warned them to be careful and reminded them to follow the safety rules they had learned in science class. The teacher passed out the materials and provided each person with an experiment book. SpongeBob and Gary flipped through the book and decided to test the properties of a mystery substance. 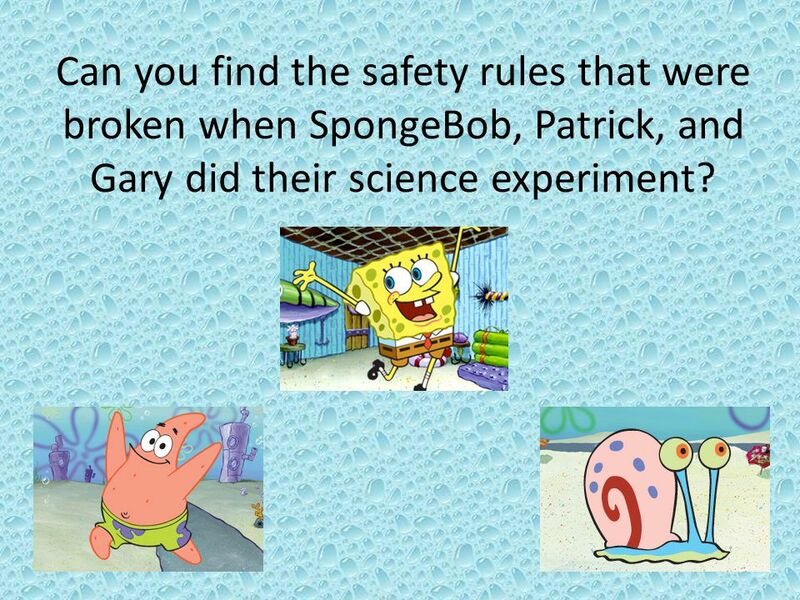 2 Can you find the safety rules that were broken when SpongeBob, Patrick, and Gary did their science experiment? 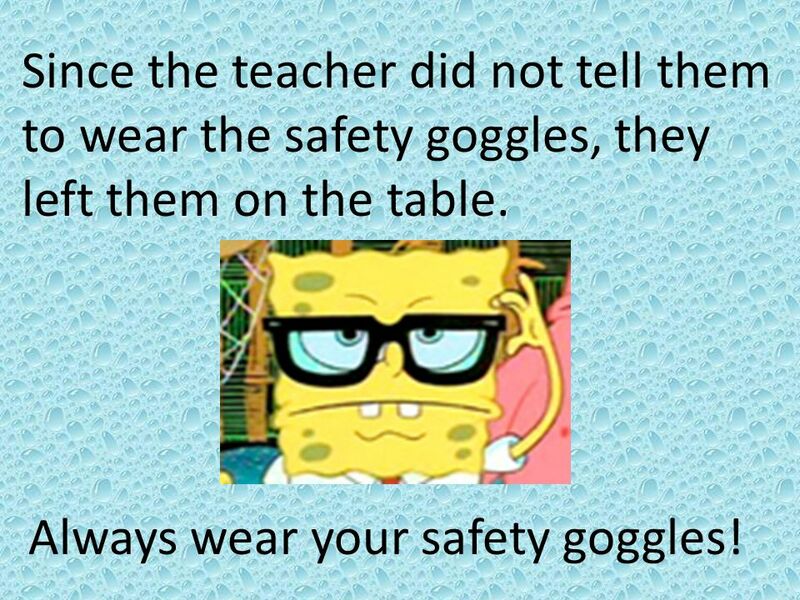 3 Since the teacher did not tell them to wear the safety goggles, they left them on the table. Always wear your safety goggles! 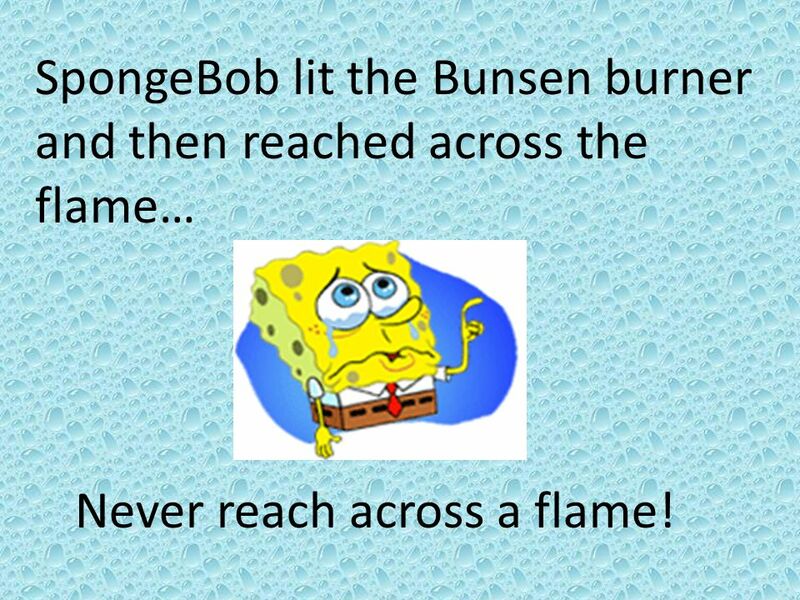 Never reach across a flame! 5 In the process, he knocked over a bottle of the mystery substance and a little bit splashed on Gary. 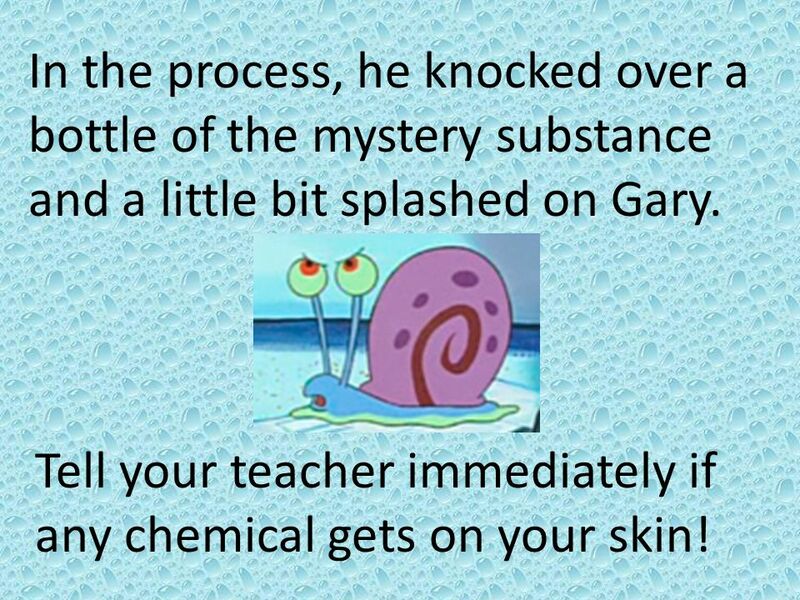 Tell your teacher immediately if any chemical gets on your skin! 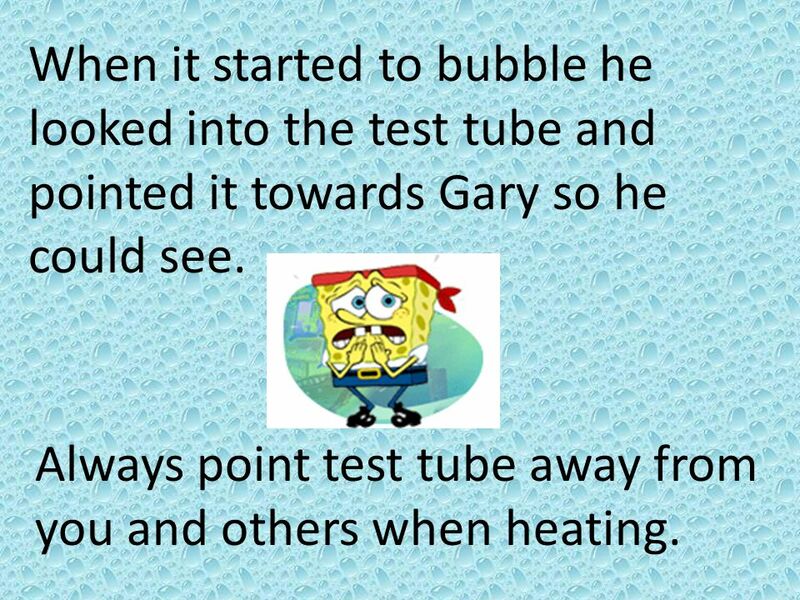 6 When it started to bubble he looked into the test tube and pointed it towards Gary so he could see. Always point test tube away from you and others when heating. 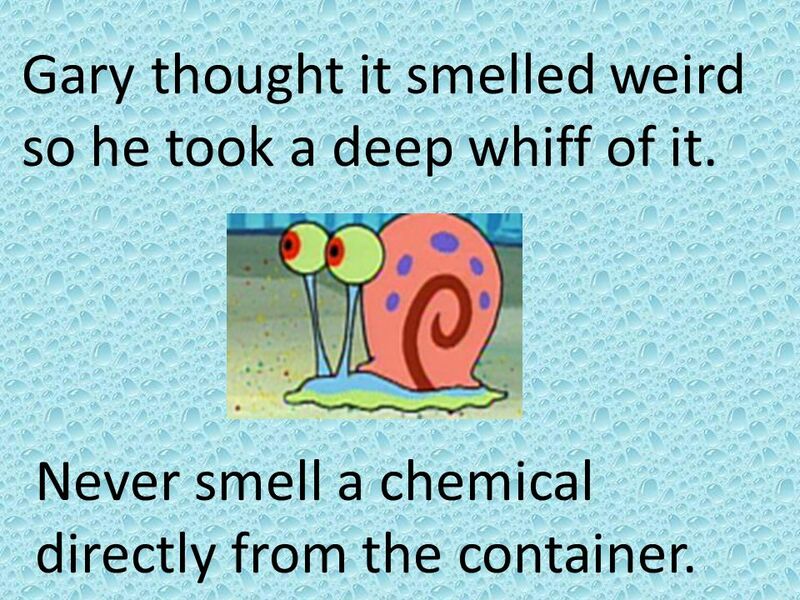 7 Gary thought it smelled weird so he took a deep whiff of it. 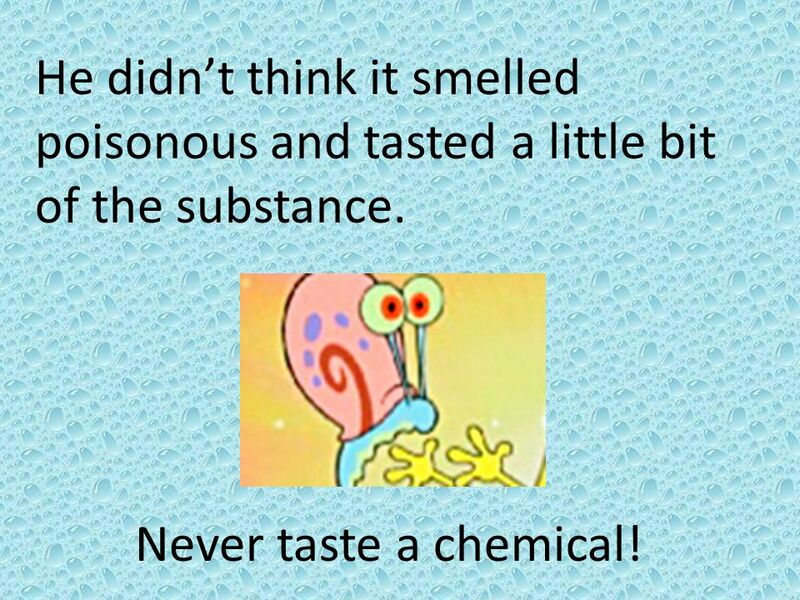 Never smell a chemical directly from the container. 8 He didn’t think it smelled poisonous and tasted a little bit of the substance. 9 Always clean up your workstation before moving on! They were worried about running out of time, so they left the test tube and materials on the table and moved to a different station to try another experiment. Always clean up your workstation before moving on! 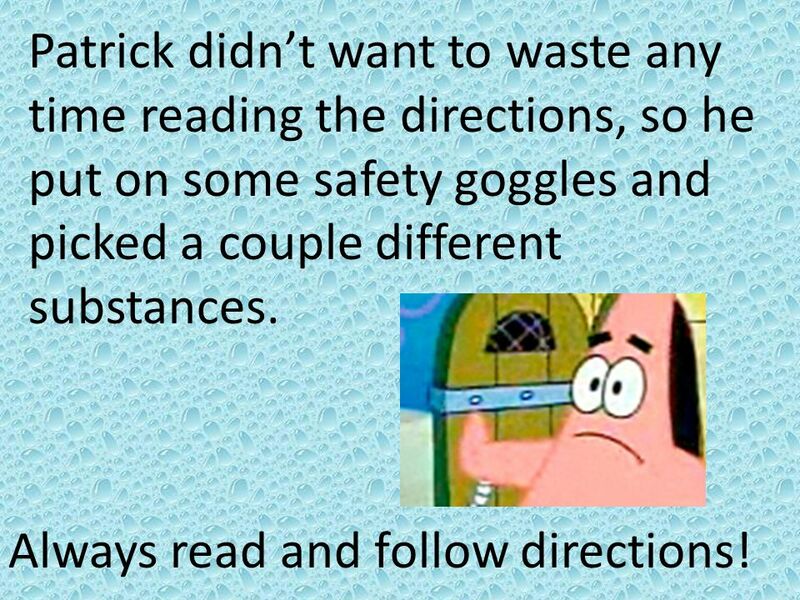 10 Patrick didn’t want to waste any time reading the directions, so he put on some safety goggles and picked a couple different substances. Always read and follow directions! 11 Never mix chemicals without your teacher’s permission! He tested them with vinegar to see what would happen even though he didn’t have permission to experiment on his own. He noticed that one of the substances did not do anything, but the other one fizzed. 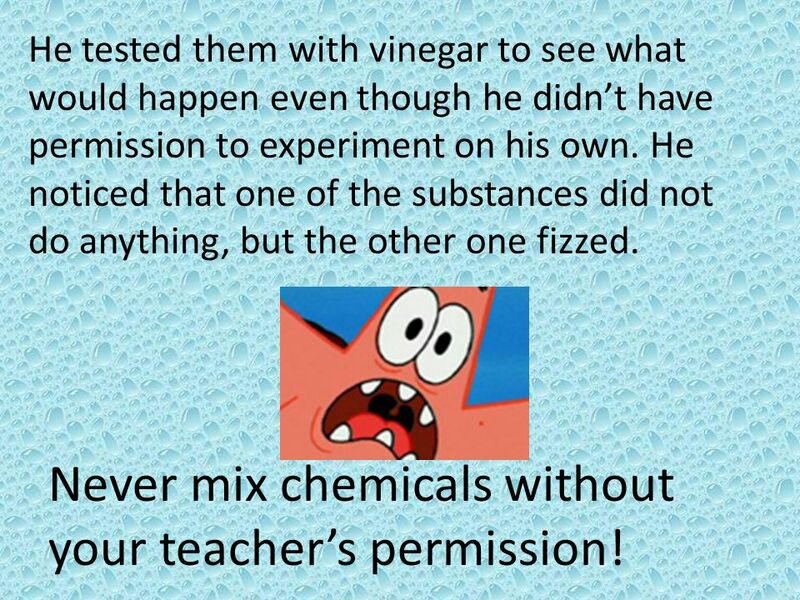 Never mix chemicals without your teacher’s permission! 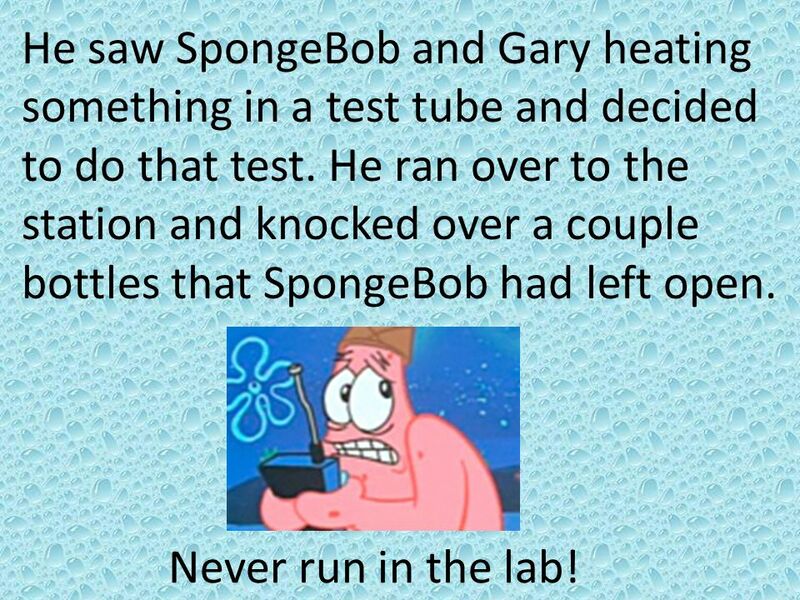 12 He saw SpongeBob and Gary heating something in a test tube and decided to do that test. He ran over to the station and knocked over a couple bottles that SpongeBob had left open. Never run in the lab! 13 After cleaning up the spills, he read the directions and found the materials he needed. The only test tube he could find had a small crack in it, but he decided to use it anyway. 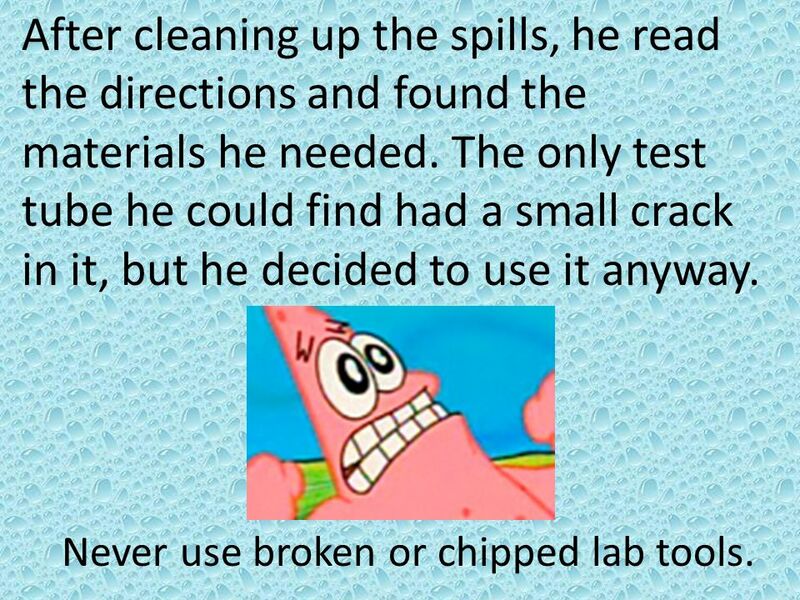 Never use broken or chipped lab tools. 14 He lit the Bunsen burner and used tongs to hold the test tube over the flame. He forgot to move his notebook away from the flame and almost caught it on fire. Keep your work area clean and keep all materials away from flame. 15 Before they could do another experiment, the bell rang and they rushed to put everything away. 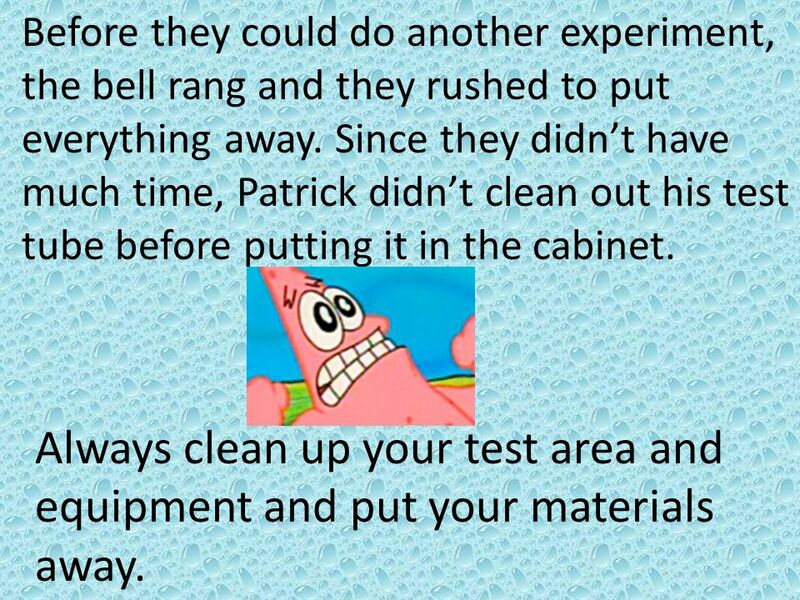 Since they didn’t have much time, Patrick didn’t clean out his test tube before putting it in the cabinet. Always clean up your test area and equipment and put your materials away. 16 SpongeBob noticed that he had a small cut on his finger, but decided he didn’t have time to tell the teacher about it. 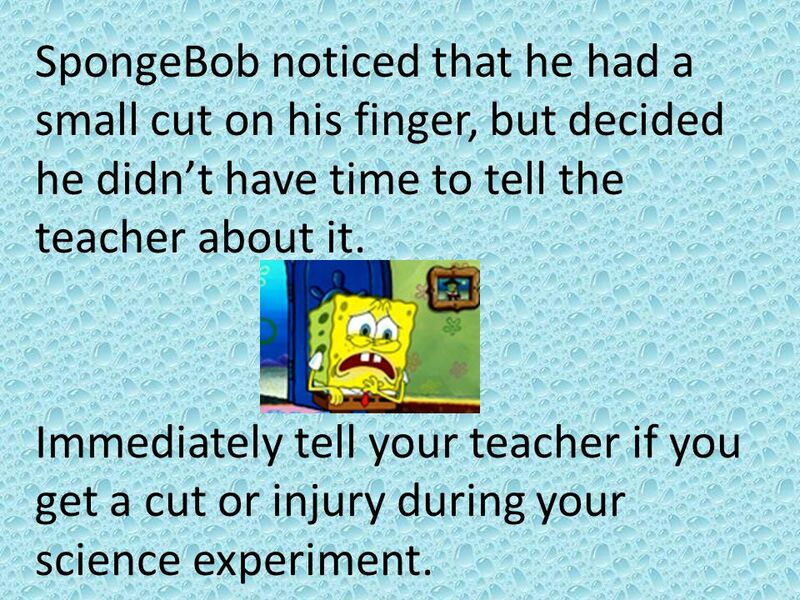 Immediately tell your teacher if you get a cut or injury during your science experiment. 17 Since they were late, they skipped washing their hands and hurried to the next class. 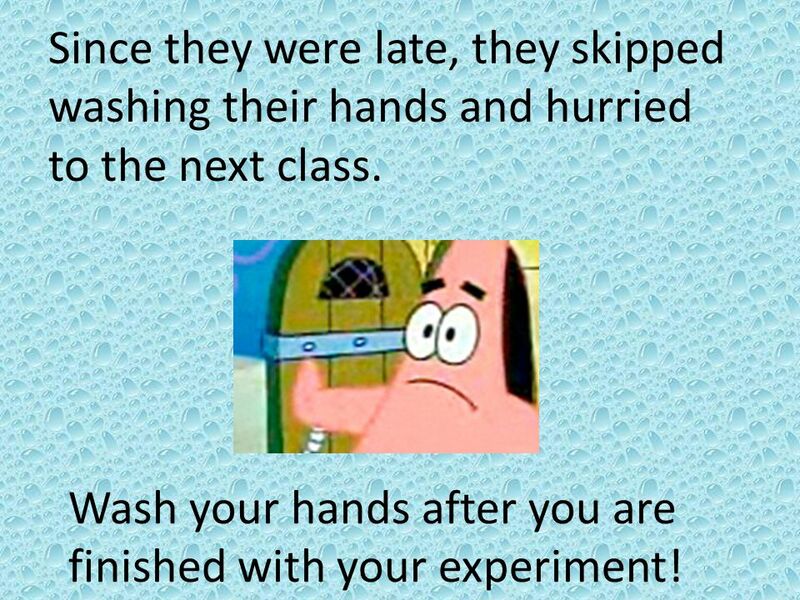 Wash your hands after you are finished with your experiment! 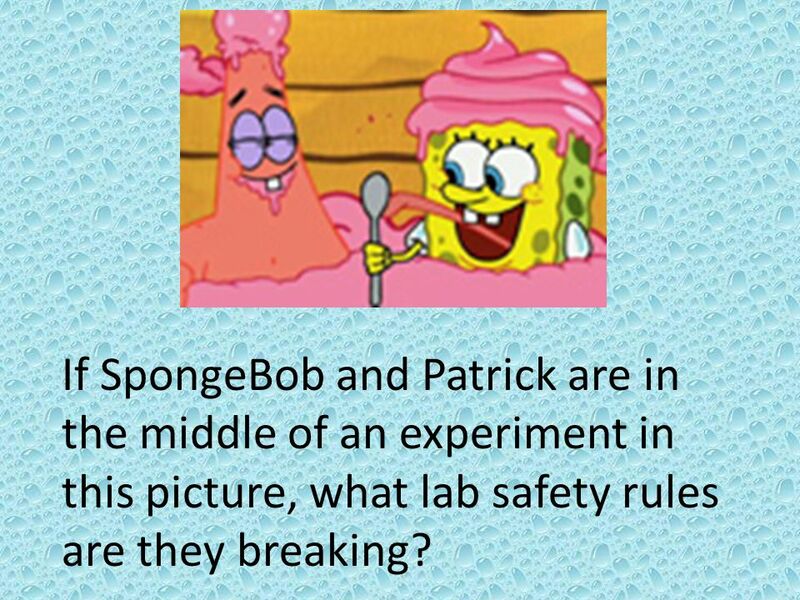 18 If SpongeBob and Patrick are in the middle of an experiment in this picture, what lab safety rules are they breaking? 19 What rules do we need to remember to follow when doing a lab? Let’s review! 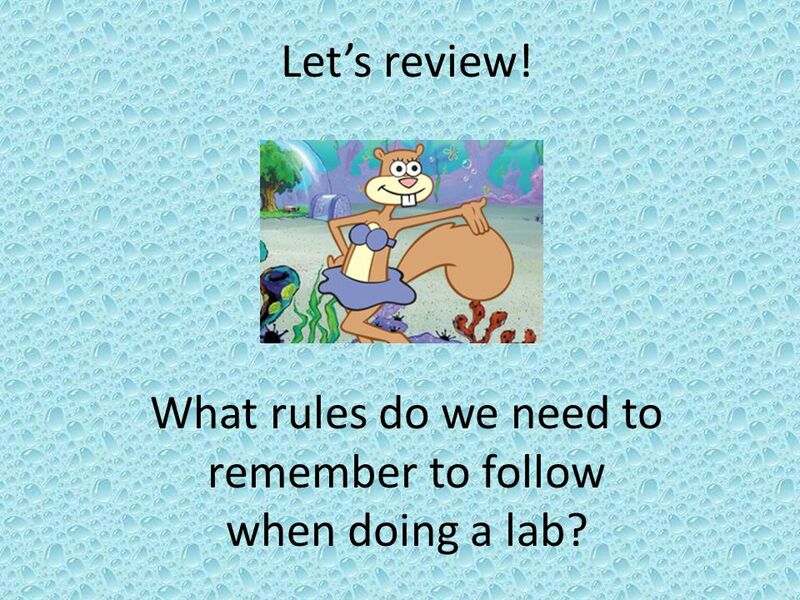 What rules do we need to remember to follow when doing a lab? 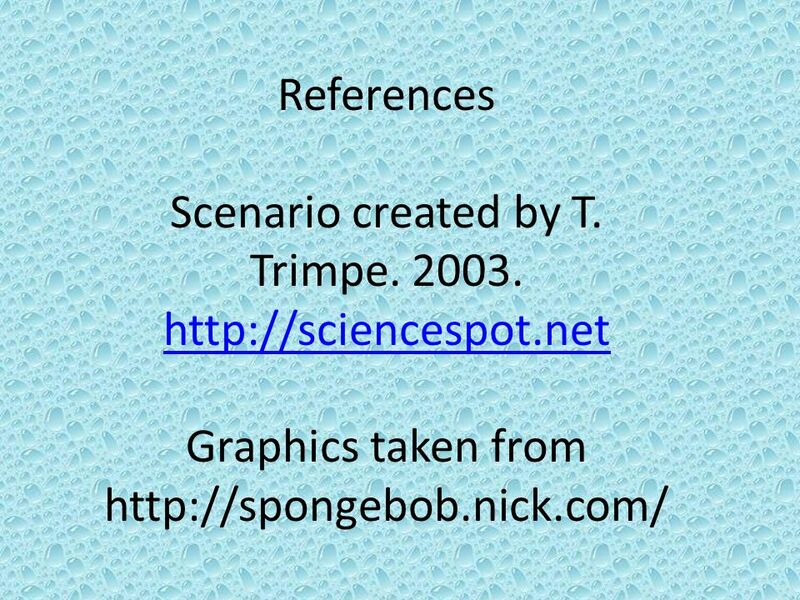 Download ppt "SpongeBob, Patrick, and Gary were thrilled when Mr"
1 Lab Safety. 2 General Safety Rules 1. Listen to or read instructions carefully before attempting to do anything. 2. Wear safety goggles to protect your. Laboratory Safety Eric Angat Teacher. Lab safety stations Class review. Safety Rules Dress Code Many materials in the lab can cause eye injury. Goggles should always be worn when chemicals are being heated or mixed. This. Safety Rules. Caustic Substances This is a substance that will cause a chemical burn on your skin. Alert your teacher to any chemical spills. Do not let. SpongeBob, Patrick, and Gary were thrilled when Mr. Krabbs told them they were going to the lab today. Mr. Krabbs warned them to be careful and reminded. Lab Safety Rules Lab Safety Rules Review Study the picture Name the safety rule represented by the picture Certain materials are included under the fair. DO NOW: Answer the following question in your notebook. Use examples and write at least 2 sentences. Why prepare for a scientific investigation? --Good. Lab Safety. General Safety Rules PURPOSE Science is a hands-on laboratory class. However, science activities may have potential hazards. We will use some. Mr. Worzel Science 6 th Grade Room 410 Impacting Futures Through Learning Today. Dress Code Always wear goggles Wear lab apron when needed Tie back long hair Secure loose clothing and jewelry Do not wear open toed shoes. 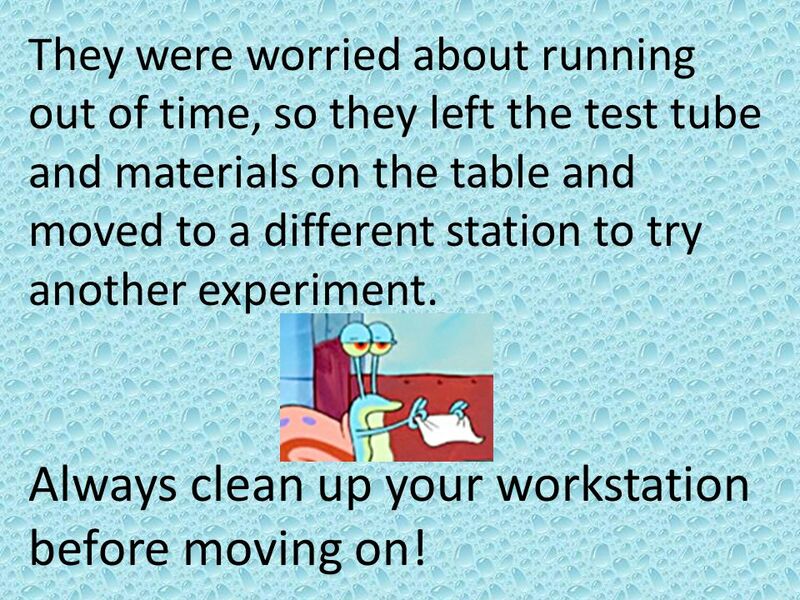 AGENDA CW: Lab safety application w/Sponge Bob and Safety Illustration. 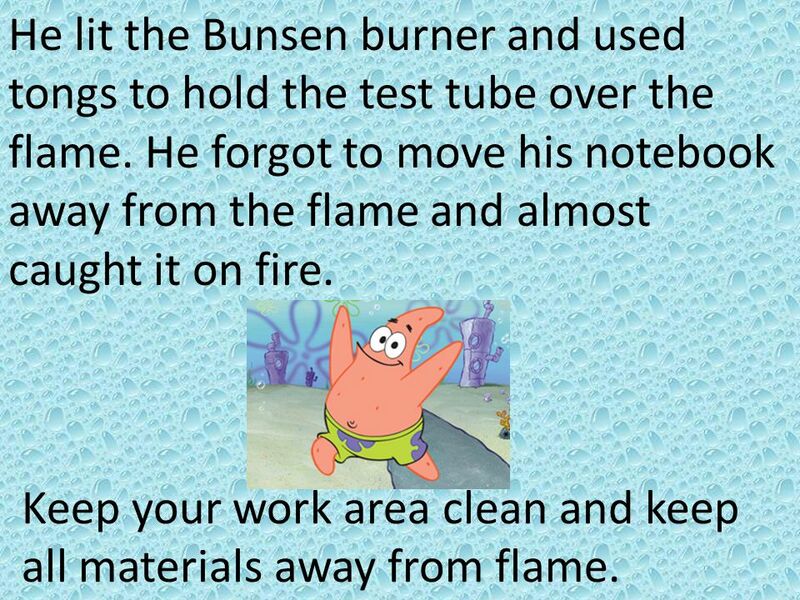 CW: Lab safety application w/Sponge Bob and Safety Illustration. HW: Study lab.